We’d read many recent articles about the evolution of the wine business in the Mendoza region of Argentina. Jancis Robinson, the Vinous team, Wine Spectator and others have recorded steadily rising scores each year for wines from what one noted writer called “the Napa Valley of Argentina,” a contrast to the reputation of a region known for producing and exporting millions of cases of lower-priced Malbec each year. The improved wines come from sites an hour to two hours out of Mendoza, where over the past decade adventuresome investors and winemakers have built premium wine operations at higher altitudes, closer to the Andes, where they found cooler temperatures and soils that could make for more elegant, balanced wines. We had tasted quality wines from Kaiken, Familia Zuccardi, Vina Cobos (with California-based winemaker, Paul Hobbs), Catena Zapata and Bodega Norton, the latter producing excellent wines under $20. 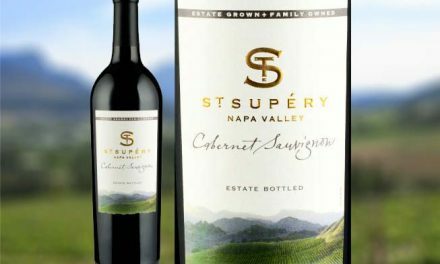 Our remote explorations had included Cabernet Sauvignon, Cabernet Franc, Bordeaux blends, Rhone blends, Tempranillo, Chardonnay and Sauvignon blanc, plus various red blends. 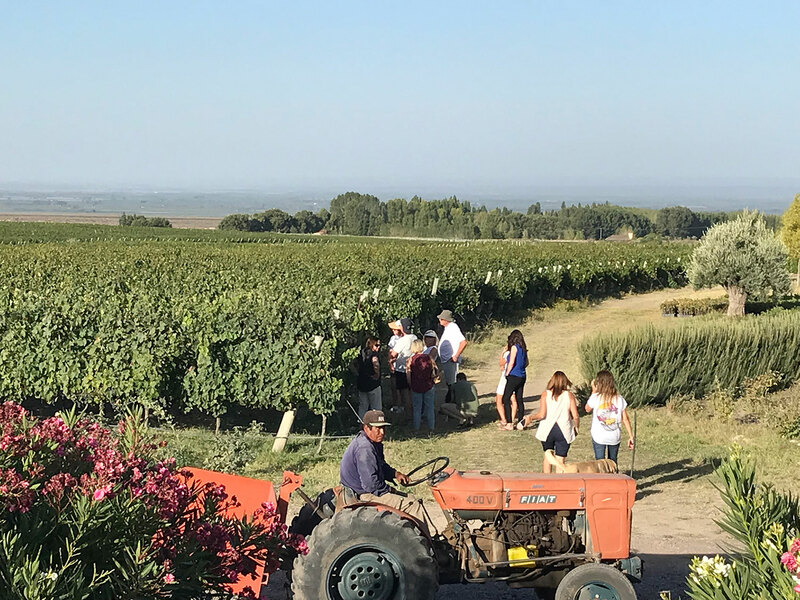 To learn more about the evolution in person, we joined a small group tour focused on the Valle de Uco region of Mendoza, including the sub-regions of San Carlos, Tunuyan, Tupungato and Lujan de Cuyo. Our leader was Michael C. Higgins, PhD, California-based author, photo journalist and publisher, who recently published “Exploring Wine Regions: Argentina.” He organized our adventures to include private tastings in wineries from big to small, exploring local cuisine, a horseback ride and barbecue along river trails and a hike from a condor research station into the highlands on the edge of the Andes. We visited in March, the end of their summer and start of fall. Harvesting was still underway in the higher elevations. 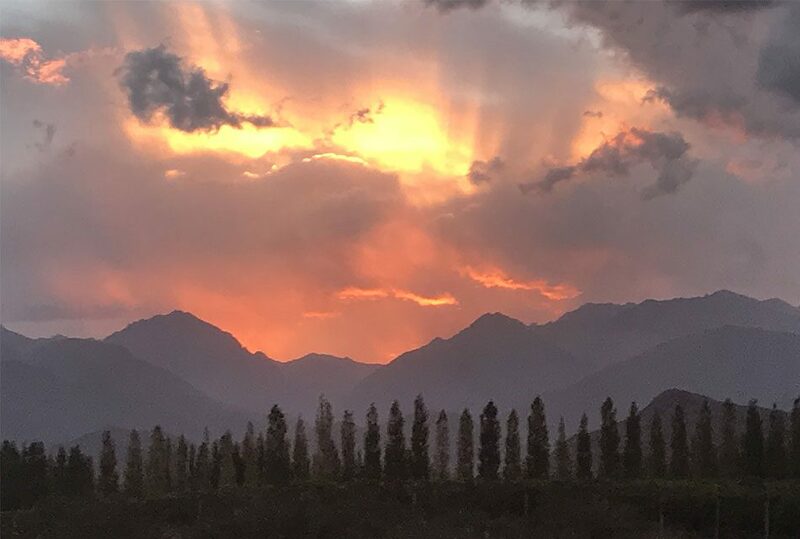 The sun rose around 7:30, lighting up the Andes, starting with long, low shadows edging across the mountains, moving up to light the tops of the mountains with a growing red glow, waking up and rising to the new day. With the season, some stands of trees had started changing colors, a yellow and orange contrast to the mountains and the long green rows of vineyards. Sunsets could turn deep red with hints of purple, like a bubbling vat of red wine during fermentation. The wineries and lodges are mostly off the main roads a kilometer or two or more. The architecture trends toward a minimalist modern style – steel, wood and concrete. 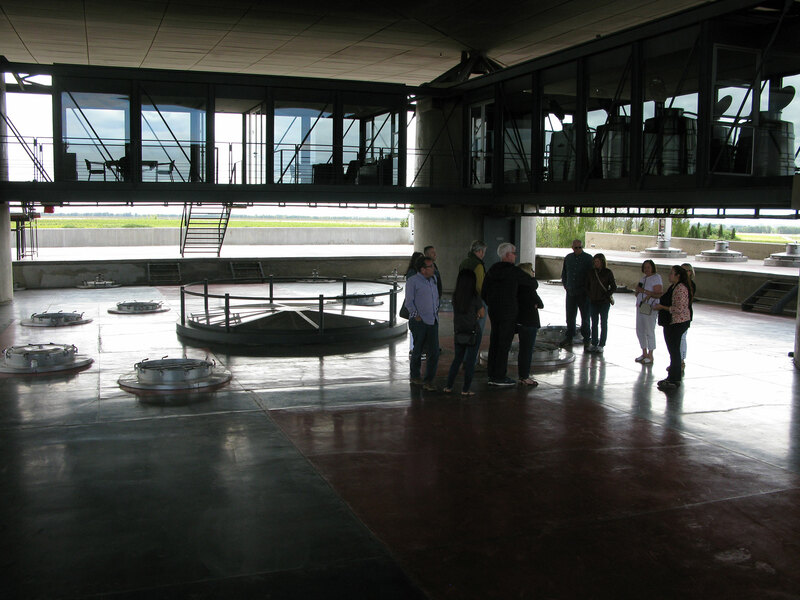 The use of concrete has many purposes, including protecting against the elements and providing natural cooling for many parts of a winery operation. O. Fournier has a wing-like roof, designed to clear out hot air with prevailing winds and reduce temperatures on the top floor, where they bring the freshly harvested grapes to load into vats in their gravity-fed operation. The Michelini brothers started Zorzal on barren land at 4,400 feet above sea level. The chalky and calcareous soils from the region resulted in wines with more style and hints of terroir than found in wines from vineyards on more alluvial soil near the town of Mendoza. Grapes for premium wines in the Valle de Uco are mostly harvested by hand. We saw pickers in the morning going up and down rows of ripe grapes on our resort property, pushing aside the leaves and ripping some off to have easier access to the bunches. Sugar contents were high – around 27 to 28 degrees, ready for making wines with 14.5 percent and higher alcohol. Since the area is semi-arid desert, water from wells is fed along neat lines of drip irrigation. The vintners have great control. But nature can intrude, as in any wine area of the world. They worry about damaging hail storms in summer and fall or late rains, when grapes are approaching perfect ripeness. Being at the foot of the Andes, changing weather can bring spring frost, as it can do in Chablis, Champagne and Burgundy. We walked on hard scrabble soil in some vineyards, with rocks scattered everywhere, including small round and oval stones like those found on some beaches and used for decorating natural gardens in California, finding it hard to picture hail and snow anywhere in the Valle de Uco. The vines everywhere looked incredibly healthy – bright green leaves and dark-colored grapes in the reds varietals and sharp green in the whites. The vines in many vineyards are pruned so the fruit hangs along the lowest canes and spurs, for greater protection from the sun. The top two-thirds of the vines act like a shade tree for the grapes. Some operations have both lower-priced and premium wines. The lower priced wines are machine-harvested. The health of the vines was impressive. Our guide, Michael, noted that French vintners come here and marvel at how few diseases and pests the Argentinians must deal with. Patrick Blousson, a native of France, was a pioneer in the Valle de Uco area, opening a winery, bistro and bed-and-breakfast hotel in Tunuyan. He makes complex, nuanced wines at his Finca Blousson. The quality recently attracted a new owner, Bono, of the Irish rock band, U-2. A major destination in the area is Bodegas Salentein. 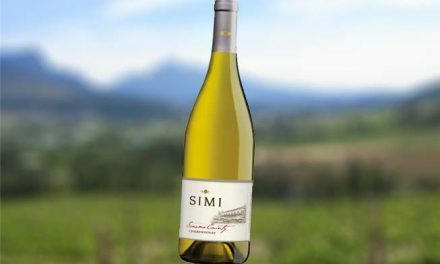 It produces 2.2 million cases a year from some 5,000 acres of vineyards that cover 22 kilometers from the lowest vineyard to highest vineyards, with elevations ranging from 3,400 to 5,600 feet above sea level leading into the foothills of the Andes Mountains. 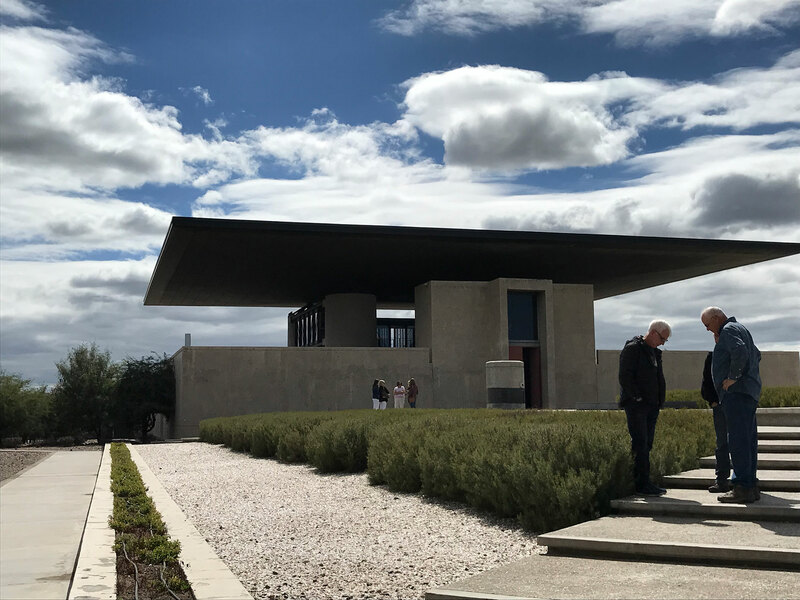 The sprawling headquarters includes two wineries, art gallery and museum, chapel, hotel and restaurant, where we enjoyed a fine lunch with wines. Zorzal was the smallest winery we visited, in the Gualtallary sub region of Tupungato, with some 25,000 cases produced annually, including its popular Field Blend of Cabernet Sauvignon and Malbec and its EGGO lines of wines, fermented in concrete eggs, which is a popular approach in the Valle de Uco. 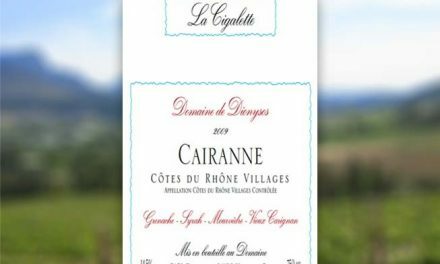 Here are notes on the top wines we tried during our one week in the region. Bodegas Salentein, 2012, Cabernet Sauvignon, Valle de Uco, $25. Mid-dark garnet; herbaceous, mint, wood nose (30 percent new oak); alcohol; mid-body; good Cab structure and flavor; opens with air (UC Davis scale, 17 out of 20; 94 other scales). Corazon del Sol, 2013, Malbec Gran Reserva, Valle de Uco, $75. Dark garnet. Peppery violet wood nose. Smooth round soft finish; elegant style (17; 94). Fournier, 2010, Malbec, Valle de Uco, $40. Darkest purple; big mint, wood, plum nose (15.0 alc. ); mid-big body; tight tannins; long fruity finish; good depth of fruit (16.5-17; 93). Bodegas Salentein, 2015, Malbec Finca La Pampa, Valle de Uco, $45. Finca La Pampa (100 percent Malbec; 18 months French oak). Mid-dark, pink edges; cedar, pepper nose; mid-body; balanced; long, fruity, lush finish (16.5-17; 93). Bodegas Salentein, 2015, Malbec Primus, Valle de Uco, $45. Dark; mint, redwood, peppery nose; balanced; rich semi-lush finish (16.5.-17; 93). Bodegas Salentein, 2015, Malbec Finca El Tomillo, Valle de Uco, $45. Single vineyard; dark purple; ripe grape nose, cedar, pepper; mid-big body; round finish. Nice style (16.5.-17; 93). Bodegas Salentein, 2014, Valle de Uco, Gran Corte Numina, $25. Bordeaux Blend (62% Malbec, 21% Cabernet Sauvignon (CS), 8% Petit Verdot (PV), 5% Cabernet Franc (CF), 4% Merlot). Spirit Vineyard. Dark purple; big berry, mint nose, cocoa; mid-body, balanced, good flavor; long semi-chewy finish, a little hot (16.5-17; 93). Gimenez Riili, 2012, Syrah, Valle de Uco, $25. Mid dark garnet. Syrah spicy nose. Peppery manzanita nose; balanced; smooth long finish; a little hot. Some style (16.5-17; 93). Alpasion, 2015, Private Selection, Valle de Uco, $35. Red Wine Blend (80% Malbec, 15% Syrah, 5% PV). Three months French oak. Mid-dark purple; light mint nose, prunes, bell peppers; mid-big body; balanced; good structure; long fruity finish (16.5-17; 93). Fournier, 2014, Nebbiolo, Valle de Uco, $50. Fifteen months in French oak, 14.0 alcohol. Dark ruby; peppery, earthy, wood nose; mid-body, balanced; some style; layered on the palate; long semi-chewy finish (16.5; 92). 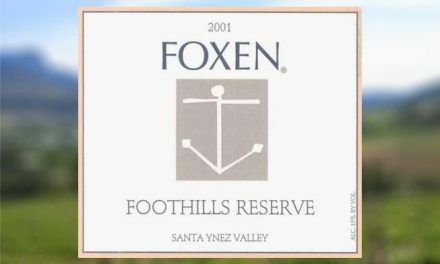 Fournier, 2010, Alfa Crux, Valle de Uco, $40. Red Wine Blend (55% Tempranillo, 25% Malbec, 10% Syrah, 10% CS). Dark garnet; Tempranillo nose; redwood, mint; big-body, tight tannins; long, hot, tight finish (16.5; 92). Finca Blousson, 2014, Sangiovese Gross, Valle de Uco, $27. Wine is 100% Brunello (but can’t use on label in the U.S.). Mid-purple, pink edges; eight months in new French oak. Big berry, oak nose; mid-body; round, ripe; good tannins, body and long finish (16.5; 92). Bodegas Salentein, 2013, Pinot Noir, Valle de Uco, $45. Single vineyard. Mid-brick; smoky, stemmy, woody nose; mid-body; tannic; tight acids; semi-chewy (16.5; 92). Zorzal, 2013, Cabernet Sauvignon/Malbec, Valle de Uco, $40. Field Blend (18-24 months in used oak barrels); dark purple; herbaceous, smoky, woody nose; mid body; balanced; long fruity finish; nice structure, semi-chewy (16.5; 92). Gimenez Riili, 2012, Gran Blend, Valle de Uco, $60. Blend (45% Malbec, 20% Syrah, 15% CS, 10% CF, 5% Merlot. New oak barrel-fermented 24 months. Dark purple. Smoky, minerals. Complex flavors. Berries, wood; hot finish but decent flavor (16.5; 92). Gimenez Riili, 2013, Malbec, Valle de Uco, Magnum, $70. Dark; mint, pepper, smoky oaky nose; vanilla (24 months in new oak). Mid-big body. Chewy. Tight. Not like a Malbec. Woody finish (16.5; 92). For more information, the Wines of Argentina website.